Darker and dicier than Bailey’s previous novels, RISKING IT ALL is no meet-cute—leads-to—easy HEA. Set in NYC’s grittiest neighborhood, teeming with criminality and imminent violence, Sera and Bowen’s tortured hearts collide inciting a pulse-pounding and all-consuming affair that commands your full attention. Equal parts blissful pleasure and shattering heartbreak, I was transfixed by this sinner and saint's perilous path to love. Deftly drawn, Sera and Bowen’s vivid drama lives and breathes and shouts in pure ecstasy. I found myself moved not only by their uncommon chemistry and enviable passion but by the stellar characters themselves. Sera and Bowen’s individual complexities, differences, phantoms and foibles made for one of the more compelling matches that I’ve encountered in a long time. 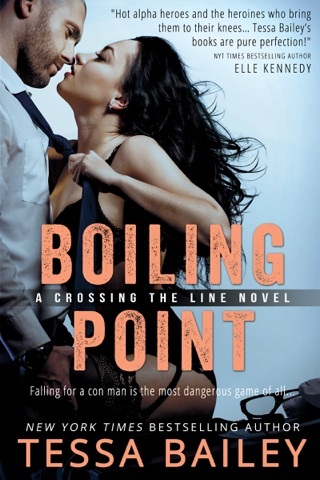 Bowen and Sera’s exceptional romance is testament to Tessa Bailey’s incomparable talent as well as a glittering addition to my latest series obsession, The Crossing the Line Series. I can’t wait until UP IN SMOKE, Connor and Erin’s story, is unleashed upon us! June 23rd can’t come soon enough!